In this article we show you some iPhone 6 and 6 plus Secret Codes that allow you to Get the most out of your iPhone 6. Iphon’s 6 has a ton of features, there’s a 17 cool secrets codes on the apple iphones 6 (6 plus) smartphone that will render your user’s manual useless. *3001#12345#* and tap Call : Enter Field Mode. Field mode contains lots of iPhone inner settings, especially newest network and cell information. *#06# : Shows your IMEI. No need to tap Call. IMEI is the unique identifier for your mobile phone hardware. *#21# and tap Call : Set interrogation for call forwards. Discover the settings for your call forwarding. *#30# : Check the calling line presentation. This shows whether you have enabled or disabled the presentation of the calling line, presumably the number of the party placing the call. *#76# : Check whether the connected line presentation is enabled or not. State whether the connected line presentation is enabled or disabled. Similar to the calling line presentation. *#43# : Determine if call waiting is enabled. Shows call waiting status for voice, data, fax, SMS, sync data, async data, packet access and pad access. Each item is either enabled or disabled. *#61# : Check the number for unanswered calls. Show the number for voice call forwarding when a call is unanswered. Also show the options for data, fax, SMS, sync, async, packet access and pad access. *#62# and tap Call : Check the number for call forwarding if no service is available. Just like the previous, except for no-service rather than no-answer situations. *#67# : Check the number for call forwarding when the iPhone is busy. And again, but for when the iPhone is busy. *#33# : Check for call control bars. Check all the usual suspects ( voice, data, fax,SMS, etc ) to see whether barring is enabled or disabled for outgoing. *777# : Account balance for prepaid iPhone only. *331* Barring code # : Outgoing calls abroad to block the lock code to inquire about her please contact your network operator. 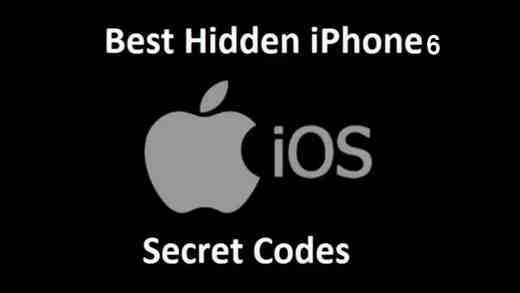 Please, if you’ve checked out the iphone ios 6 hidden secrets codes on your iphones 6 or 6 plus or another iphones smartphones, have you ever had it catch any issues? Let me know in the comments!